MOSUL, Iraq (CNS) — As some residents of the city of Mosul celebrate their new freedom from the Islamic State group, an Iraqi Christian leader who visited the war-torn city said Christian residents are unlikely to return. “I don’t see a future for Christians in Mosul,” said Father Emanuel Youkhana, a priest, or archimandrite, of the Assyrian Church of the East. Father Youkhana, who runs Christian Aid Program Northern Iraq, a Christian program for displaced Iraqis around the city of Dohuk, entered Mosul in a military convoy Jan. 27, the day Iraqi officials raised the national flag over the eastern part of the city. Islamic State seized the city in 2014, causing Christians and other minorities to flee. Once inside Mosul, Father Youkhana moved about freely, talking to residents and soldiers. He visited two churches, both heavily damaged. One building, belonging to the Syriac Orthodox Church, had not been completely swept for explosives, according to Iraqi soldiers in the area. The front of the building was painted with an Islamist slogan by the Islamic State, and a military commander told Father Youkhana his troops would gladly paint over it. Father Youkhana replied that it was not his church, so he had no authority to authorize the troops. “And leaving it as is preserves the evidence of what Daesh did here,” he told Catholic News Service. At another church, owned by the Assyrian Church of the East, the body of an Islamic State fighter poked out of a pile of garbage in front of the sanctuary. Father Youkhana, who went to high school in Mosul, also photographed several houses that belonged to Christians, but had been given or sold to Muslim families by the Islamic State. 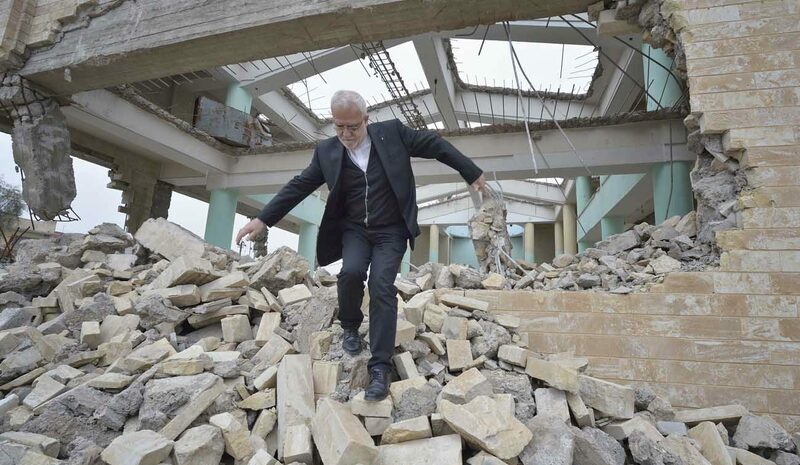 While he doubts Christians will return, he believes they will be able to recover the value of their properties, notwithstanding attempts by the Islamic State to destroy local government records. “Christians aren’t going to come back to stay. The churches I saw were not destroyed with bombs, but by the everyday business operations of the community. How can Christians return to that environment? It’s unfortunate, because Mosul needs their skills. Most Christians were part of the intellectual and professional class here, they were doctors and lawyers and engineers and university professors. But I don’t see how they can return,” he said. Father Youkhana would make no predictions how long peace will last once the Islamic State is driven completely out of Mosul, a predominantly Sunni Muslim city. The Iraqi army units that expelled the Islamic State are largely Shiite Muslim. Several of the military’s armored vehicles sported flags of the Popular Mobilization Units, a Shiite militia, and Father Youkhana said he saw several examples of graffiti written by Shiite soldiers calling for violence against the Sunnis. “Why do they do that?” he asked. “They are undermining their achievement. People are thanking them for liberating them, and in return they try to provoke them. Just because they have the upper hand now. Father Youkhana also visited Qaraqosh, a Christian town 20 miles southeast of Mosul that he described as “a ghost town.” While Mosul was bustling with busy markets and people digging out from the rubble of war, the streets of Qaraqosh were eerily silent, with most houses blackened by fire but still standing. He explored the remains of the Syriac Catholic cathedral, reportedly the largest church in Iraq. Blackened by fire, its courtyard was filled with the ashes of what had been the church’s library, as well as shell casings and bullet-ridden mannequins that the Islamic State apparently used for target practice. Some Christian leaders are pushing for a quick return to Qaraqosh. One Christian member of the Kurdistan parliament said he is looking for $200,000 that would finance the return of 50 families, buying them the basic furniture and household items they need to re-establish themselves in their houses. But Karim Sinjari, Kurdistan’s interior minister, told a visiting ecumenical delegation that neither the necessary security nor appropriate infrastructure are in place. Iraqi Christian leaders echoed his concern. “Unless there is security, whatever we build will be for Daesh, not for us,” said Syriac Orthodox Bishop Nicodemos of Mosul. Some residents of Qaraqosh have returned, carrying weapons and wearing uniforms of the Ninevah Plain Protection Units, or NPU, a militia formed by the Assyrian Democratic Movement, an Iraqi political party allied with the Shiites. It operates in coordination with the Iraqi military, which has assigned it primary responsibility for protecting Qaraqosh and a nearby village. Father Youkhana said he is troubled by the NPU’s role. Fadi Raad is tired of running from the Islamic State, so the 25-year-old Qaraqosh native joined the NPU and today patrols the streets of the town on the lookout for lingering terrorists. “I’m here to defend my village, and because I want to save the Christians in Iraq. It’s difficult here now, but when the government and the NGOs repair all the houses, then the Christians will come back. The NPU is here to stay. It’s different now. If Daesh comes back, we will kill them all,” he said.